Got your attention, did I??? We arrived at Two Rivers RV Park in the afternoon and got settled in. That night, we all went to John A’s, a restaurant just up the road. The food and the band were good, and our waiter Jared was a hoot! Diana’s and my alma mater…the Western Michigan Broncos…were on the TV, playing in the MAC Championship. We ended up winning, finishing our season 13-0 and are going to the Cotton Bowl to play Wisconsin on January 2. Woohoo!!! This has been an especially memorable season for us, as our friends Karen and Bill’s son Billy is on the team. 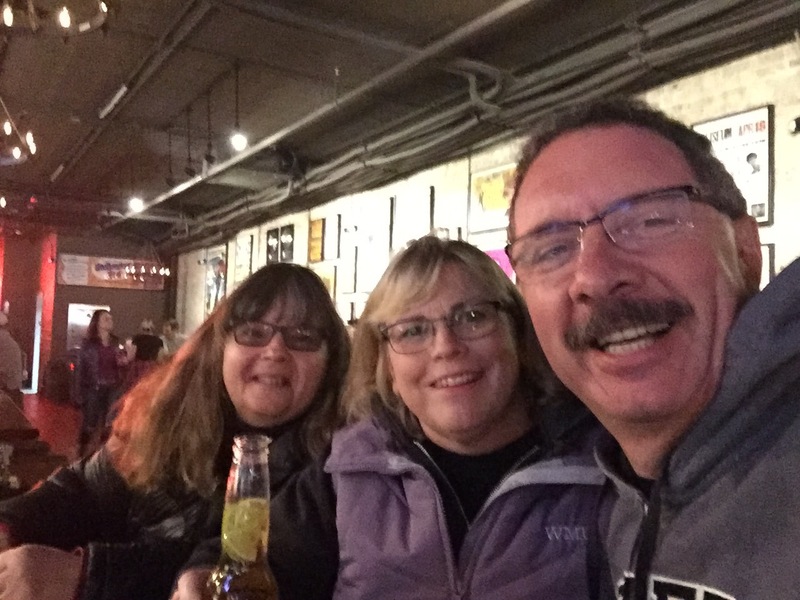 On Saturday, Jodee’s husband Bill wasn’t feeling well, so it was just three of us heading downtown. 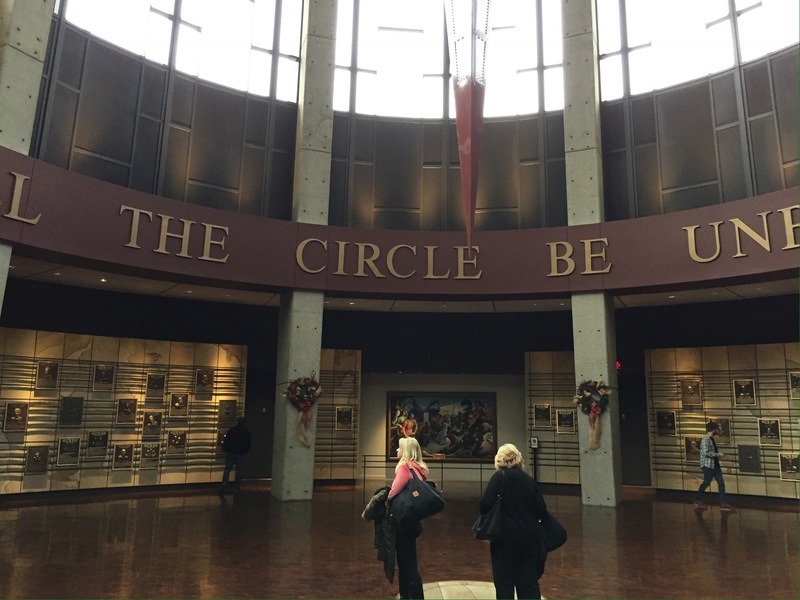 Our first stop was the Country Music Hall of Fame and Museum. 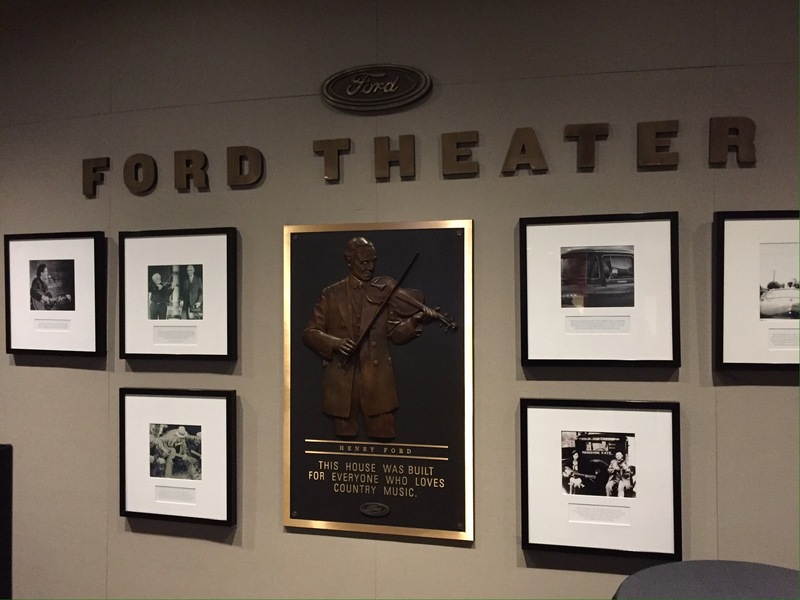 Inside the building, we saw this plaque on the Ford Theater. That’s Henry Ford, playing his fiddle. He loved to take Model T road trips with friends and camp out, playing his fiddle around a campfire. Seeing as I grew up about three miles from where he did, I guess we have a lot in common. Better take up fiddle playing! 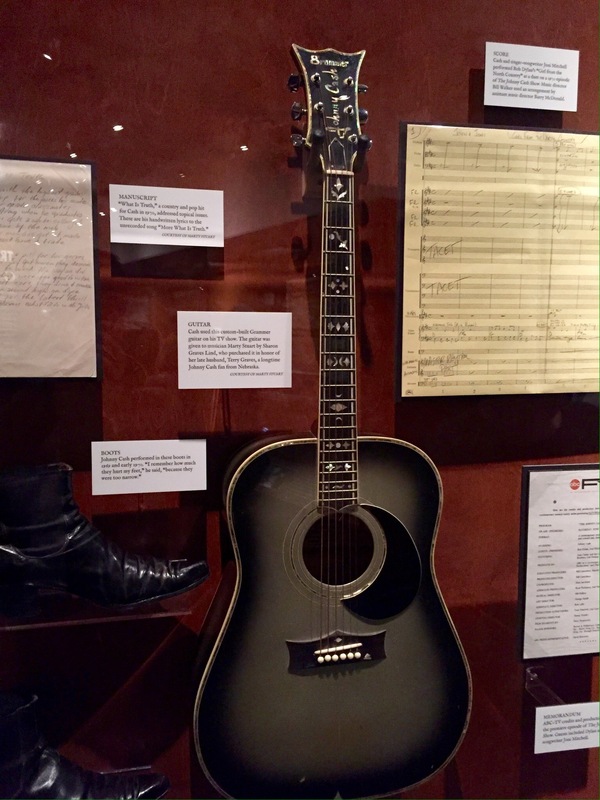 Inside the museum, there were displays that paid tribute to the many stars of country music. Some displays went beyond the stars, depicting the genre in American culture. 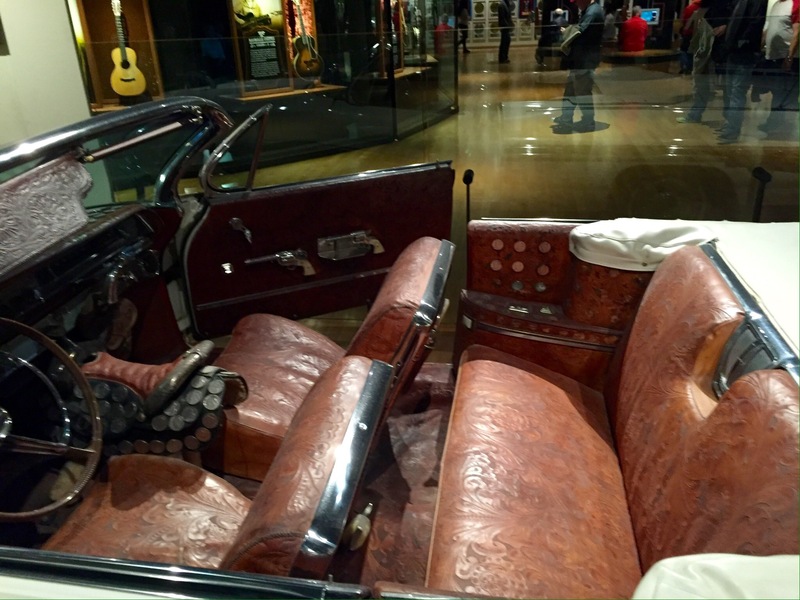 Here is a Pontiac Bonneville owned by Webb Pierce. It was customized by Nudie Cohn. More on him later in the post. Yes, that’s a saddle for a console and those are real silver dollars adorning it. This particular display was about Johnny Cash. I found it interesting that the boots he performed in for two years were too narrow for his feet. 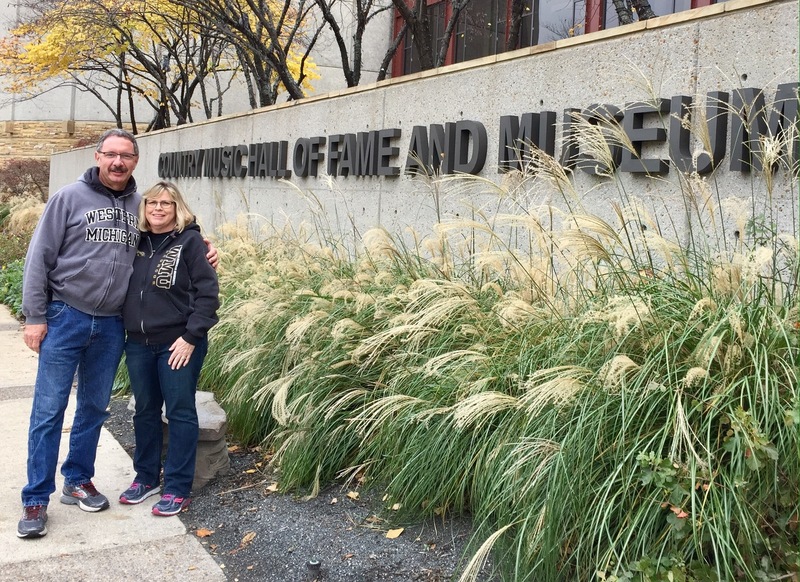 Bill and Jodee’s friend from high school, Bill Miller, recently opened another museum entirely devoted to Johnny Cash just a block away from the Hall of Fame. Jodee wrote about her and Bill’s visit the day before here. 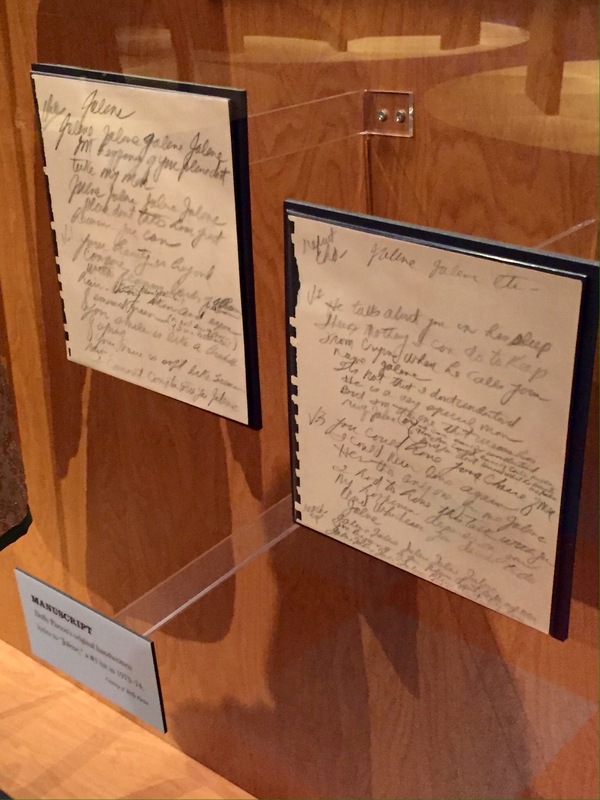 This is Dolly Parton’s original manuscript of the lyrics for the song Jolene. I always enjoy seeing these, as there are often words crossed out that the artist decided to change. This particular one impressed me, as she virtually made no corrections. Dolly had a very clear vision of what she wanted this song to say. There was a huge display on when Bob Dylan came to Nashville in 1969 and recorded his album Nashville Skyline. This was the album that gave us Lay Lady Lay, and included vocals by Johnny Cash and guitar work by Charlie Daniels. It was fascinating that during such a turbulent time in history, Bob Dylan was writing country songs. The album is considered to be one of his best. I was so focused on this part of the museum, I forgot to take photos! The actual Hall of Fame rotunda had plaques for each star that were inducted into the hall, very similar to the plaques in the Baseball Hall of Fame. The band around the top of the room had the words Will the Circle be Unbroken from the often recorded Christian hymn of the same name. 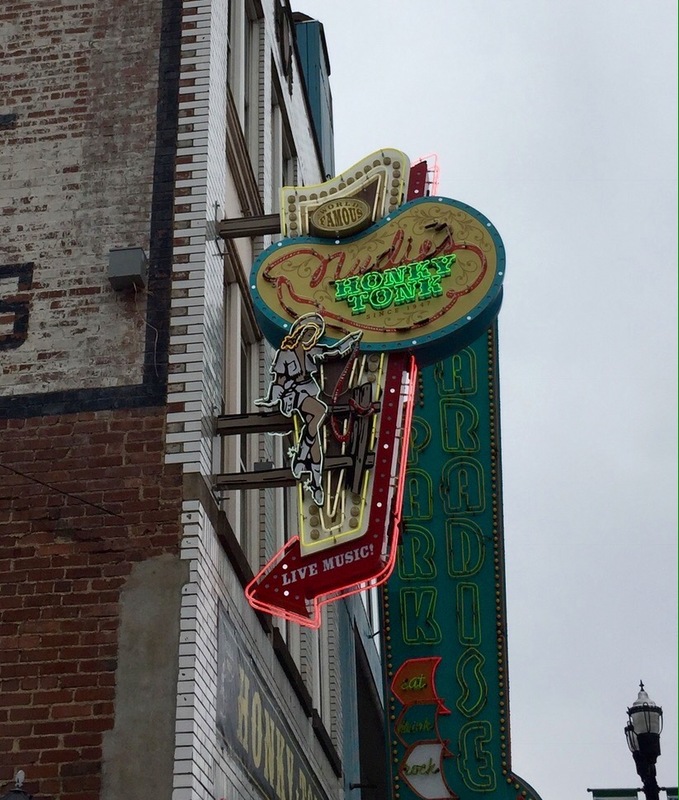 Once we finished up at the museum, we headed over to Nudie’s Honky Tonk. 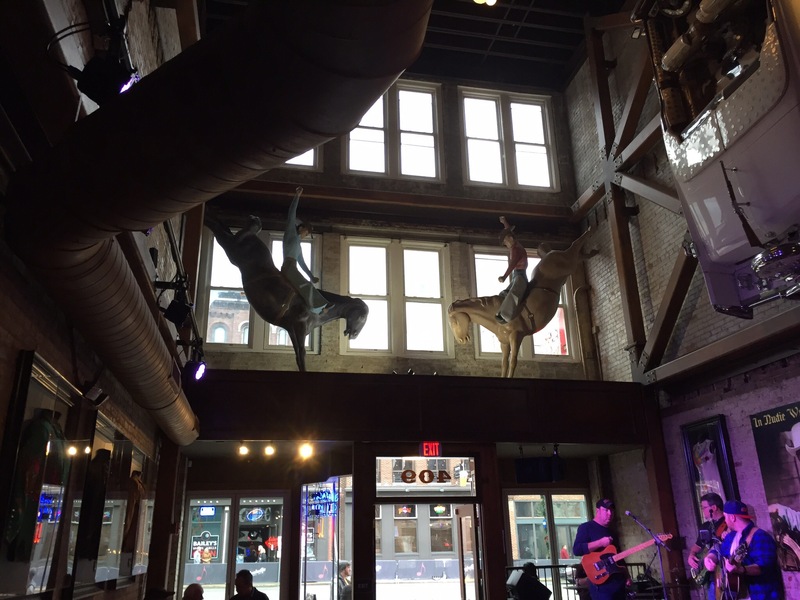 This bar/restaurant/music venue/museum was just opened by Jodee and Bill’s friend Bill Miller…the same person who opened the Johnny Cash Museum. So you might be wondering how Mr. Cohn got his name? Well, he was born Nuta Kotlyarenko in Ukraine, and when he passed through Eliis Island when immigrating to the United States, the immigration official changed it to Nudie Cohn. Nudie was a tailor, first working in New York and later in Hollywood, California. He is the one credited with putting country music legends in rhinestones. 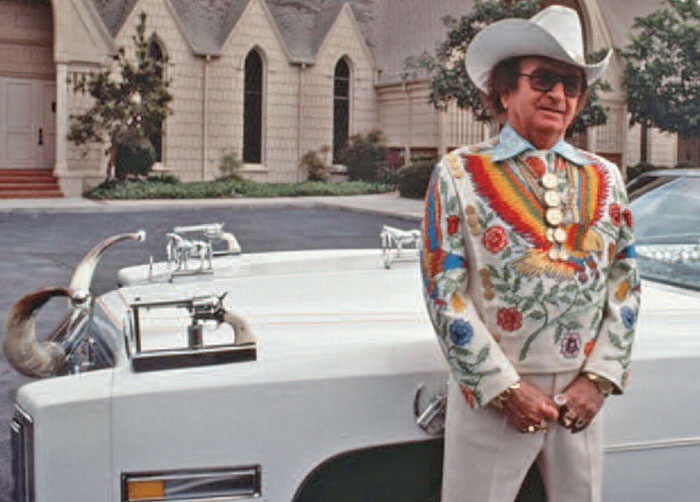 Here is Nudie with his custom Eldorado Cadillac; one of many cars he had customized with tooled leather, chrome pistols and rifles, silver dollars and longhorns above the grille. 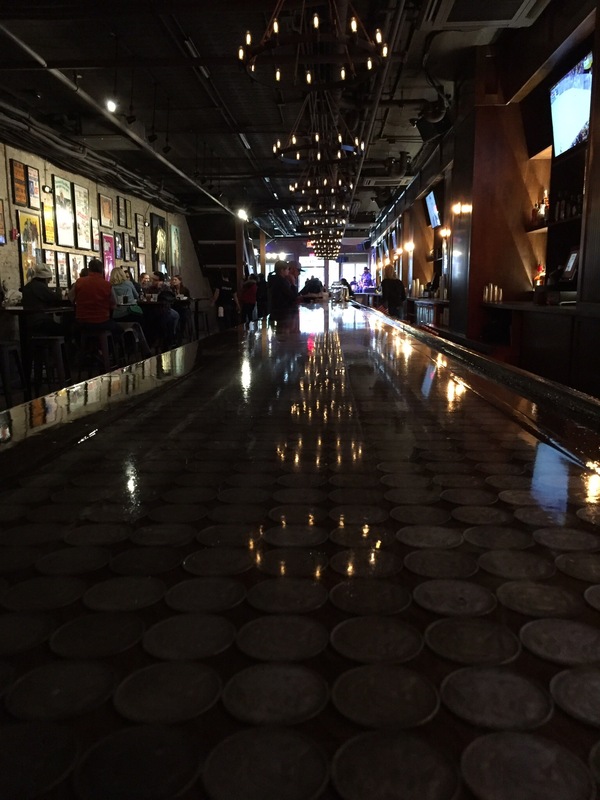 Nudie’s Honky Tonk is located on Broadway, right in the heart of downtown Nashville in the building that used to house the Lawrence Brothers record store. The three story tall structure has three performance stages. 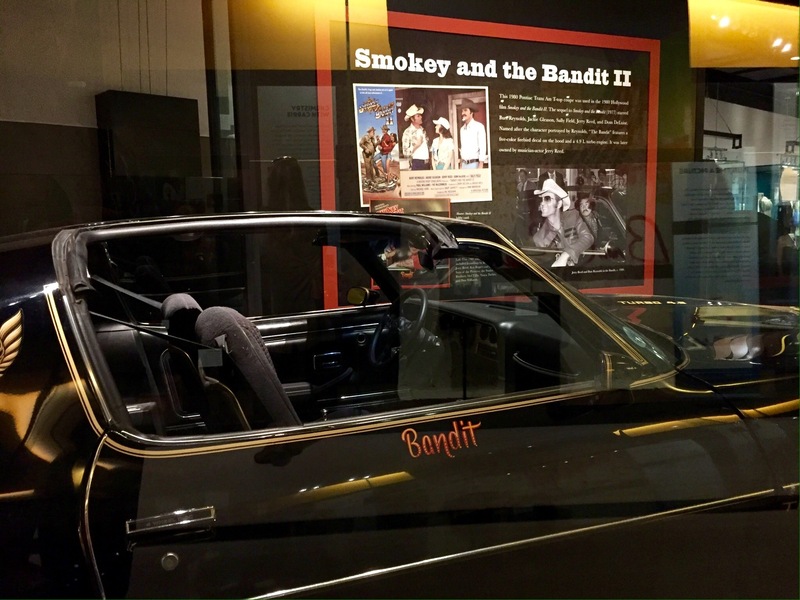 All along the walls were display cases with Nudie suits that belonged to stars such as Hank Williams, Elvis, Porter Wagoner, Merle Travis and Hank Snow, to name a few. Above the entrance were the two bucking broncos that were on the Nudie’s Rodeo Tailors shop in North Hollywood from the 1960’s through the 1980’s. 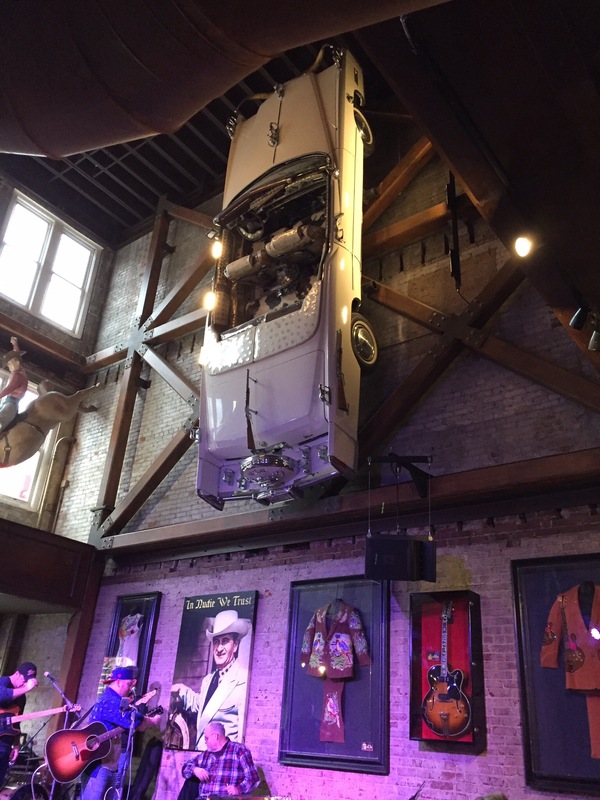 And there, hanging above the main stage, is Nudie’s custom Eldorado. Just fabulous! The food and drink were outstanding, as was the music. This is definitely a must-stop if you come to Nashville! So here’s a toast to Nudie, some great Nostalgia, and to Nashville! Search and shop Amazon here! We have never met Bill and Jodee but it seems like all of our other RV friends have seemed to run across them in our travels. They sound like a really fun couple. We want to get to Nashville at some point as both Barb and I are huge country western fans with our favorite artists being Merle, Johnny, Willie and Waylon among other old time artists. We just find it hard to get into some of the new country out there right now. I’m sure you will meet up with them (and us!) sooner than later, Jim! Ahhhh, what a great post Jim! 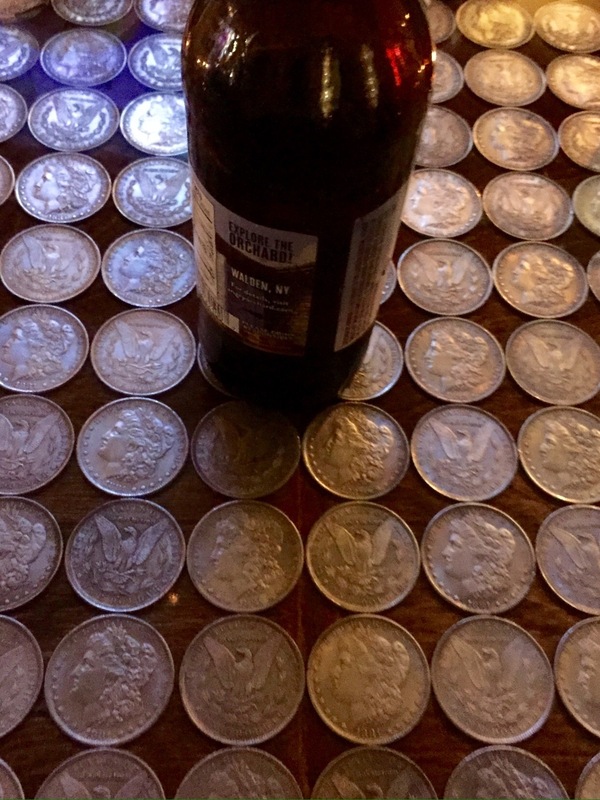 So glad you did all the background research so I can just link to yours :-))) You got some really good pics in Nudie’s – love the silver dollar bar. It really was a great time, so glad you guys were able to join us for the weekend. I see we have lots of places to visit on our next trip to Nashville. Guess we need to stay for a while. Seems we are only ever there for a day or two. Glad to see you got to spend more time with Bill and Jodee. Sorry to read Bill wasn’t feeling well and missed your fun day. It’s amazing how big Nashville has gotten, Pam. We always seem to find something fun to do when we are there. Jodee and Bill are super people, and Tessa is such a sweet puppy! Seeing all your museum photos has me thinking… In the U.S. we have a lot of places to visit (some museums, others not ‘true museums’) that are really focussed on individual humans. Sometimes I wonder whether this country is obsessed with celebrity. Yeah — there are museums that cover events and things, but I wonder whether the celebrity-ness is as common in other nations. Of the countries I’ve visited (dunno… maybe 9 or 10) I don’t think that is the case but I haven’t done a survey either. Something else to think about…. let our teams do the talking…. that’s making the assumption that I’m actually a fan…. I have a very loose relationship to anything football. Always such fun to meet up with other bloggers! Looks like you had an amazing time taking in so much history. We always have fun in Nashville, Sue. Somewhere packed away we have a photo of Diana standing at the mike at center stage of the Ryman way back in the 1980’s. That would have been fun to include in the post!